Mark Taylor takes you through the week 11 slate of college football action and provides the top eight plays to dominate your book! Fresno State is legit. Boise State is good, but hanging on to their name a bit. These Mountain West rivals played twice last year with Fresno handling them 28-17 in the regular season finale and then fell the following week in the MW title game by three points. This year, Fresno has taken two steps forward and Boise has taken one back. Sure, it’s in Boise and the blue turf and all, a place that the Bulldogs have not won in their last nine attempts. Fresno is an amazing 8-1 overall and holds that same impressive record against the spread. Some would worry that this is due to regress to the mean eventually. And it is. But not this time. The Broncos are home dogs for the first time since 2001 and they are just that for a reason. This Fresno team has a great offense led by quarterback Marcus McMaryion and his dual-threat ways. Their defense is the story. 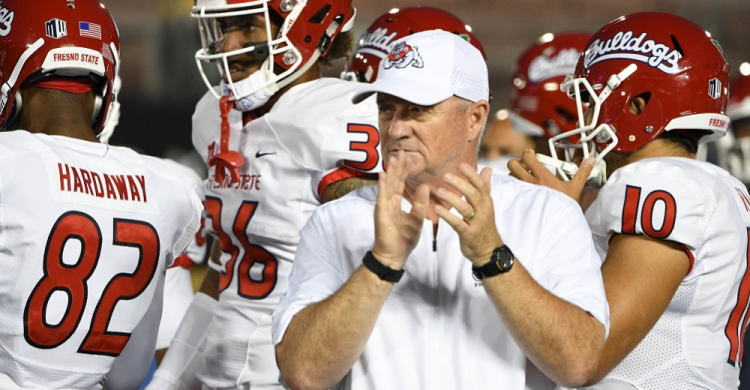 Head coach Jeff Tedford knows the importance of keeping Boise RB Alexander Mattison under wraps and forcing Brett Rypien to beat them and that ridiculous ball-hawking secondary. This should be a great game, but wiht the line under a field goal, I’m jumping all over the Bulldogs. When searching for Overs, I like to look at the ability / inability in one facet of the game that provides an edge. In this one specifically, it is the Ole Miss passing attack against the A&M pass defense. The Aggies have a generally sound and solid defensive unit. However, if they have been susceptible in one area, it is the passing game. The passing game is something Ole Miss does very well. The 16-point output against Auburn is weighing on the minds of oddsmakers, but it wasn’t as if they couldn’t move the ball on a solid Tigers defense. It helps that the Rebs are an underdog as well. Throw in a just awful Ole Miss defense that won’t likely do much to stop Kellen Mond, Trayveon Williams and company and we have the makings of a back-and-forth shootout, with the better team (A&M) winning in the end. They just didn’t finish. Sure, it’s a lot of points, but it won’t be when they cruise past it in the third quarter. This is contingent on both Ole Miss starting QB Jordan Ta’amu and RB Scottie Phillips playing - both are nursing undisclosed injuries. If either is deemed out prior to kickoff, I’m bailing on this one. I know, I know. Eventually this Fresno State and Utah State thing has to end, right? Well, maybe. But not against San Jose State. This Spartans team is downright bad. According to S&P+ numbers, they rank 125th in offense and 105th on defense in the country. The fact that they finally won a game is a blessing in disguise because of some crazy narrative that they’ve actually improved. They beat UNLV, who is in disarray and went right back to their losing ways against a Wyoming team that hasn’t scared many teams this year themselves. Giving up 30+ never leaves you with a great feeling as the backdoor is almost always in order, but I see this one getting out of hand and following a similar game script from the Aggies last victory over Hawai’i, a game they won by 39. Oh, and Hawai’i is a better team than SJSU. Just do it. Vegas can’t seem to get over the fact that BYU went into Madison, Wisconsin and beat the Badgers by three. That is a thing that happened. However, that was a thing that happened back in mid-September, almost two full months ago - and a lot has changed. Throw out the win the following week against McNeese (30-3) and this Cougars team has lost four of five games. Sure, they are all reasonable losses to good teams (at Washington, Utah State, NIU and at Boise State), but the fact remains. This UMass team has been inconsistent and the defense has been downright horrendous at times. BYU is 103rd in offensive S&P+ so that should help negate that. UMass QB Ross Comis has taken over for an injured Andrew Ford and promptly put up 540 and four touchdowns last week against Liberty. Throw in a top wide receiver in Andy Isabella and the Minutemen have enough offense to hang with BYU. Then, take into account that the Cougs need to fly across the country for a somewhat early kick certainly can wreak some havoc. Two touchdowns is just too much. I know, it’s a lot of points and the Irish are usually overrated at home with a lot of public money going their way. However, it can’t be understated how bad the Seminoles really are. Even their defense, which was to be their saving grace has fallen a bit from said grace and allowed 115 points the last two weeks to Clemson and NC State. I don’t care how good those offenses are, if you are a top-10 defense as many believe, that doesn’t happen to you. FSU’s offense is putrid and ND’s defense is still solid. It’s going to be cold and possibly snowing in South Bend and that’s another advantage for the Irish in this one. It doesn't phase me that Ian Book is out injured as Notre Dame has a quality, experienced backup in Brandon Wimbush. Just too much points to Notre Dame running away and the Seminoles not even wanting to come out of the heated locker room. It’s very difficult to go against a team that has won their last four by an average of 51 points. This could end up being the toughest test of the year for the surging Tigers. A couple of reasons to like the Eagles to keep it close. First of all, they are at home. Secondly, they are perennially underrated by Vegas as evidenced by a 15-3 run against the spread. They defend as well as anybody in the country and if there is any offensive line ready to handle the extreme pressure put forth by the daunting Clemson defensive line, it is this one. All of that and you’ll likely still be sweating it out towards the end. The Tigers have overcome some slower outings (including a near loss at Texas A&M) and have turned it up a notch since freshman Trevor Lawrence has taken the reigns of the offense. However, other than Florida State, whose once vaunted defensive unit has been thrashed a few times themselves, Clemson and Lawrence haven’t faced a test on the road like they will in this one. Kelly Bryant was still the starter during that A&M battle in College Station. Now, all of this is contingent on all-everything back AJ Dillon playing for the Eagles. He was banged up in their last game but should be ready to go. If nothing else, he’ll provide enough of a threat to keep that defensive front honest and allow QB Anthony Brown to do his thing in the passing game. Miami is on an 8-1 straight up and 7-2 ATS against Georgia Tech. Sure, the ‘Canes have questions on offense finally settling on N’Kosi Perry to start this one at quarterback. But, Georgia Tech’s defense may be just what they need to get back on track. They’ve allowed exactly 28 points in their last three games and while that figure isn’t bad this day in age of ACC football, it was against a banged up Duke, Virginia Tech and North Carolina. So, that’s to say that this offense will provide enough of it to let the defense win this game. That defense, ranked 9th in S&P+ is doing their thing and both this squad and head coach Mark Richt have a firm grasp on how to stop the option. Plus, they have the talent and speed to do so. Throw in a really bad special teams unit for the Yellow Jackets and expect the ‘Canes to come out with a plan on offense and in shut down mode on defense. Plus, they are GETTING points. Miami wins this straight up. The University of Alabama-Birmingham didn’t have a football program two years ago. Let that sink in. Now, after reinstating and starting over, they are 8-1 and shattering all expectations. They have a good balance of offense, defense and special teams and do what it takes to win ball games. Southern Miss is coming off a solid upset win over Marshall but are just two weeks removed from a bad loss to a really bad Charlotte team. They have some quarterback issues as the starter Jack Abraham is banged up and freshman Tate Whatley is more of a dual-threat guy. If Abraham returns, he’s coming back from a horrendous performance against the 49ers (210 yards, 0 TD, 3 INT). UAB will feast on offensive instability as they have all season. The Blazers have the edge on both offensive and defensive lines. Plus, they are at home for the final time this season, a place they play very well. The support for the program has returned and they have a lot to be proud of. UAB comes out and dictates both sides of the ball and dominates, continuing their incredible run and keep their lead over Louisiana Tech in the C-USA West.